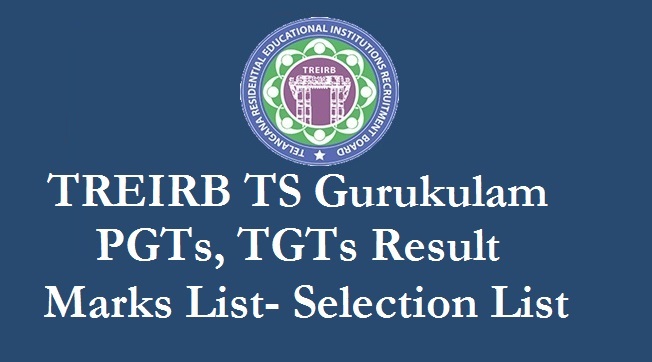 TS Gurukulam PGT TGT Results, 1:2 Certificates verification selected List 2019, Marks List OMR Sheet Download at treirb.org TREIRB TGT, PGT Results, Certificates verification dates for 1:2 list of Candidates 2019 TS Gurukulam TGT PGT Results 2018 Marks List OMR Sheet Download Cutoff Marks & Merit List (Paper 1,2,3). TS Gurukulam Results 2018 For TGT PGT Paper 1,2 & 3 : Telangana Residential Educational Institutions Recruitment Board (TREI-RB) conducted the TGT (Trained Graduate Teacher) & Post Graduate Teacher (PGT) examination for Paper I, Paper II, and Paper III on various dates in September and October months. Many of the hopefuls have attended the TREI-EB Gurukulam TGT and PGT written test as per the scheduled dates. The examinations conducted on 28th September, 29th September, 1st October, 3rd October, 8th October for Paper II and Paper III and 11th, 12th, 13th October, 22nd, 23rd, 24th October. now provisional selection list for certificates verification available here. Telangana Gurukulam PGT TGT Results, Certificates verification 1:2 selected List 2019, will be made available at www.treirb.org said Praveen Kumar, Chairman TREIRB. గురుకులాల్లో పీజీటీ జీవశాస్త్రం, భౌతిక శాస్త్రం పోస్టులకు 1:2 నిష్పత్తిలో మెరిట్‌ జాబితాను వెల్లడించినట్లు గురుకుల నియామక మండలి కన్వీనర్‌ నవీన్‌ నికోలస్‌ తెలిపారు. ఈ పోస్టులకు జనవరి 18 నుంచి 22వ తేదీ వ‌ర‌కు ధ్రువపత్రాల పరిశీలన జరుగుతుందని వివరించారు. అభ్యర్థులకు ఇప్పటికే సంక్షిప్త సందేశాలు పంపించామని, పరిశీలన షెడ్యూలు, ఇతర వివరాలకు బోర్డు వెబ్‌సైట్‌ సందర్శించాలని సూచించారు. Provisional dates for Original Certificate Verification of applicants in the Ratio of 1:2 for PGT Posts under Notification No. 02/2018. Venue: Telangana Social Welfare Residential School/College Narsingi, Ranga Reddy District, Hyderabad. (Bus No. 123 from Mehdipatnam to Narsingi). P.V. Srinivasa Rao, O.S.D. TREI-RB:8309436806. The TREI-RB is going to announce the TGT and PGT result soon on its official website, treirb.telangana.gov.in. The result will be released in 1st week of November. Hence the aspirants who have competed for Telangana TGT And PGT posts can expect their results in the month of november. Keep checking the TREI-EB Official portal for more updates. TS Gurukulam TGT PGT Cutoff Marks, Merit List 2018 The cutoff marks for TGT and PGT exams will be announced by the organization. Competitors scoring the cutoff marks/qualifying marks in the test will be forwarded to the next rounds. The cutoff marks will be based on various factors. Along with the result, the organization will also release the cutoff marks. Candidates can wait for more updates regarding the results and cutoff marks. I got total 93.50 pgt social, will I get qualified Pls reply.